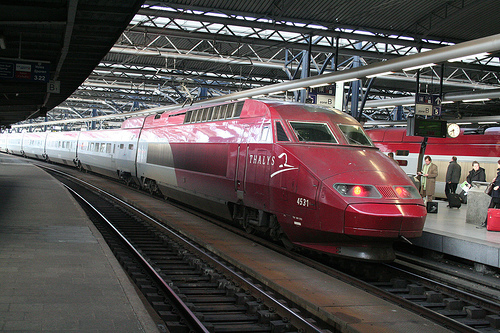 A high-speed train in Brussels. Photo by Matthew Black, via Flickr. Click above to see the photo on Flickr. One of the challenges of building a bullet train in California is that it would be the first of its kind in the United States and all the expertise on how to design, build and operate the trains is currently overseas in Europe and Asia. After the jump is a press release from the California High-Speed Rail Authority about an MOU they signed with Belgium for help in planning the high-speed rail line here that officials hope to build between San Diego, Los Angeles, Sacramento, San Jose and Sacramento. Attentive readers know the project still faces a lot of obstacles — there are still disputes about the route and, of course, there’s the matter of finding $30 billion to complete the initial Anaheim-to-S.F. leg. That said, I do think the agreement shows that foreign nations and firms are keeping on eye on how things develop here for one simple reason: some foreign firm or firms is going to get some work on the project. SACRAMENTO – The California High-Speed Rail Authority signed a memorandum of understanding (MOU) today with the country of Belgium to continue sharing high-speed rail planning and development information. The agreement, with Belgium’s Federal Public Service Foreign Affairs, Foreign Trade and Development Cooperation, was approved by the Authority Board at its May 2010 meeting. Belgium has been operating high-speed rail since 1997, with routes connecting Belgium to France, Germany, the Netherlands and the United Kingdom. The agreement includes the exchange of information on technical standards, purchasing and building methods, engineering know-how, funding options as well as operations and maintenance data. “Belgium has extensive experience and expertise in providing high-speed rail technology, with neutrality and objectivity towards technical references, standards and manufacturers. The Belgian railways have been instrumental in making European high-speed rail a success, through international technical integration. We’re happy to share this experience with the California HSRA”, said Geert Criel, Consul-General of Belgium. The signing of the agreement was followed by a presentation by Joseph M. Borremans, Senior International Project Manager and Representative for North-America of TUC-RAIL (Belgian Railways group). TUC RAIL extended and modernized one of the world’s busiest railway networks situated at the heart of Europe and has been involved in many international projects, acquiring valuable experience as a leader in high-speed rail technology. This demonstrated interest in California’s project is the latest to accompany similar agreements between the California High-Speed Rail Authority and seven other countries operating high-speed rail. The California High-Speed Rail Authority is the state entity responsible for planning, constructing and operating an 800-mile-long high-speed train system serving California’s major metropolitan areas.